I went to the Climate March in London -a 50,000 strong triumph – so the organisers say. It was cold literally and otherwise and I walked through the march feeling like an outsider until I got to the front where the Wretched of the Earth bloc were marching. It was good to walk with the Global Pan Afrikan Peoples Parliament, it was good to hear Ken Saro Wiwa‘s name being called, it was good to meet with the young members of Black Dissidents it was good to meet Indigenous people from the South Pacific, Peru, Northern Scandinavia. But in one bizarre moment, there seemed to be some confusion about who should be at the front. The big NGO’s tried to push the Wretched of the Earth out of the way. Some of them were wearing giraffe and zebra head pieces. I guess because giraffes matter more than PoC and Indigenous human lives. In the weeks leading up to the march I spoke with PoC activists about participation in conversations about climate change and the consensus was that the climate change movement was colonised by the white middle class. Those suspicions proved true at the march. Why is there a lack of understanding that human bodies are at the frontline of these climate struggles? It’s as if the people of the Global South must always play victim, we are trotted out to perform but we must otherwise stay silent, we cannot articulate our pain, we cannot celebrate our triumphs, we cannot mourn our dead, we cannot shout our defiance. As the Climate Change talks begin today in Paris, it is really crucial to ensure that the voices of indigenous communities and people of the Global south who are at the frontline of climate change’s effects are heard. Don’t white wash climate change. Don’t colonise the climate change movement. We are watching you, governments of the Caribbean, Africa and Asia who are still convinced that industrialisation is the only way forward, yes you bauxite mining in Jamaica, yes you T&T with your obscene levels of CO2 production per capita, yes you Nigeria with your unchecked oil pollution, yes you India trying to steal land from the Adivasis. To the governments of the Caribbean, Africa and Asia who are aiding and abetting corporate colonialism, we are watching you and promise that our communities are finding each other, we are linking our struggles and we are joining voices and forces for justice. The song the Sami people of Northern Scandinavia raised for Mother Earth is still ringing in my ears. It was more of a wail really, echoing through the heart of Babylondon. I sang for my own African and Indigenous ancestors, on behalf of those killed for profit, to demand justice not just for the destruction of their bodies but for the destruction of their land, their rivers, their way of life. The climate march was a stark reminder to me that we can’t wait for others to decide what we need to be doing for ourselves. And in as much as we know that these spaces continue to attempt to deny us our voices, we have to continue to hold the line, stand firm, claim space and shout for justice. We have to remind them this week and everyday that without Indigenous and PoC participation, any conversation about climate change is meaningless. Supreme Court final judgement says ultimate decision on Niyamgiri mine lies with local ‘gram sabhas’ (village councils). Defiant and loud demonstration at Vedanta headquarters. In London, activists from Foil Vedanta and other grassroots groups descended on Vedanta’s nominal Mayfair headquarters later today celebrating what they see as a victory for local self-determination, but calling for thorough independent oversight of the decision making process which they say is wide open to abuse by Vedanta officials and state police. They held a loud noise demonstration, and held a banner stating ‘MoEF – No U-turn on Niyamgiri‘ while shouting slogans with a large megaphone. The protesters again called for Vedanta to be de-listed from the London Stock Exchange for poor corporate governance and human rights crimes. 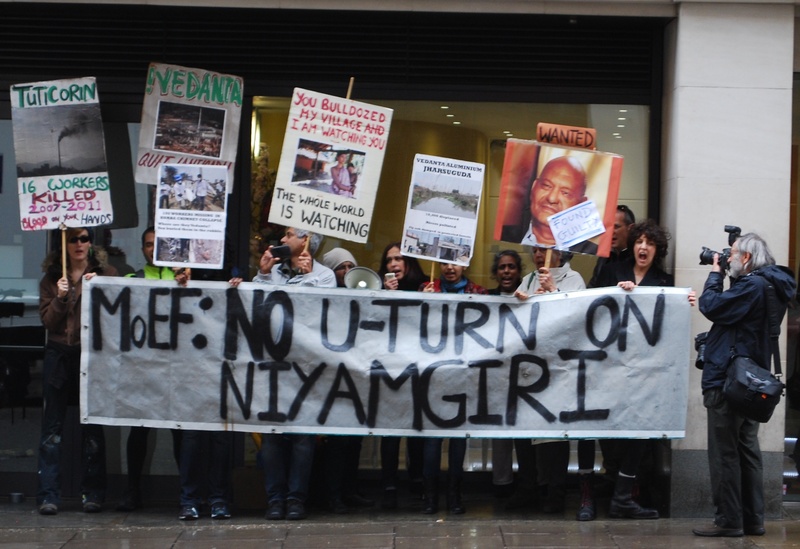 Protesters in London today staged a loud protest at Vedanta’s headquarters in reaction to the Supreme Court’s judgement to leave the final decision on Niyamgiri to the people affected, which they see as a victory for self-determination and tribal rights. They again added their voice to demands by parliamentarians and financiers that Vedanta is de-listed from the London Stock Exchange for its poor corporate governance, illegal operations and major human rights violations such as those committed at Niyamgiri. (1)(2) In January Foil Vedanta handed documentation on a variety of abuses to the Financial Services Authority who are now investigating the company’s abuses and the case for de-listing2. In February David Cameron again used his India visit to pressure Indian PM Manmohan Singh to allow Vedanta’s Niyamgiri mine. “For ten years Vedanta has harassed local people and committed major abuses and illegalities in its attempt to push this flagship project through. For ten years farmers, Dalits and Adivasis living around Niyamgiri have fought to save their traditional communities and their sacred mountain, from a mine which would give just four and half years worth of bauxite for the 6 million ton per year refinery as planned by Vedanta Aluminium. The Supreme Court is right that decision on the mine should be with those affected by it – the ancient inhabitants of the mountain. But the Dongria and others have stated their disagreement over and over again through Gram Sabha’s and mass rallies. We know that Vedanta officials have been very active in lobbying the judges leading up to this decision, and are concerned that the villagers will be under heavy harassment from Orissa state and Vedanta officials. We call for many independent observers to oversee this crucial process. “The historic judgement delivered by the Supreme Court today recognises the community, cultural and religious rights of tribals. The Dongria Konds can now establish the abode of their Niyam Raja. The Supreme Court verdict is significant as it recognises the rights of tribals against mighty mutlinational corporations”. Vedanta are also in more trouble as a major acid gas leak earlier this month led to mass protests at Vedanta’s copper plant in Tamil Nadu, India, which have forced the plant to close until the National Green Tribunal has made a recommendation on whether it should be allowed to re-open at all. Their report is expected on 29th April8. The Niyamgiri project has been racked with controversy from the start, as a spate of recent coverage points out: The Lanjigarh refinery built to process the bauxite from the hills was illegally constructed, the court case presided over by a judge with shares in the company, and the refinery should never have been given permission without including the associated mega mine in impact assessments9. A cover story in major Indian glossy Open Magazine in December details evidence of corruption and collusion between Vedanta and the Odisha state government, local officials, judges and the police to force the project through10. (1) British registered mining company Vedanta have been named the ‘world’s most hated company’ by the Independent newspaper for their long list of environmental and human rights crimes for which they are being opposed all over the world11. Most famously Vedanta’s plan to mine a mountain sacred to the Dongria Kondh tribe in Odisha, India, has led to mass protests and the Church of England among others pulling out investments. (2)Most recently MP John McDonnell raised a debate in the House of Commons calling for the Financial Conduct Authority to use its powers to investigate and de-list companies guilty of major human rights violations such as Vedanta. Other parliamentarians, financiers and the former CBI Director Richard Lambert have also highlighted how Vedanta’s listing is used for legal immunity to hide their corporate crimes. Vedanta was described in Parliament by Labour MP Lisa Nandy as ‘one of the companies that have been found guilty of gross violations of human rights’ . Ms Nandy in her speech quoted Richard Lambert the former Director General of the CBI: ‘It never occurred to those of us who helped to launch the FTSE 100 index 27 years ago that one day it would be providing a cloak of respectability and lots of passive investors for companies that challenge the canons of corporate governance such as Vedanta…’.12. The court has ordered the Odisha government to share details of the mining proposal with the gram sabha. The gram sabha has to make up its mind in three months and share its decision with the Environment Ministry. The ministry had refused clearance for the Vedanta group’s massive bauxite mining project in the Niyamgiri Hills in August 2010. It withdrew clearance after the N.C. Saxena committee warned that mining in Niyamgiri will severely affect the ecology and the habitat of the primitive Dongria Kondh tribe that lived on the mountain slopes. The state-owned Odisha Mining Corporation, which has a joint venture with Sterlite, a Vedanta group company, had challenged the environment ministry’s withdrawal of clearance in the Supreme Court. The Supreme Court had in 2008 given permission to Sterlite India for the diversion of 660 hectares of forest land in the Niyamgiri Hills for mining bauxite. The Centre also withdrew earlier permission given to Vedanta to expand its 1 million tonne alumina refinery to 6 million tonnes at the Lanjigarh block of Kalahandi, also in Odisha. Vedanta shut down its Lanjigarh alumina refinery on December 5 last year, citing shortage of bauxite. According to their agreement, Odisha Mining Corporation was supposed to supply up to 150 million tonne of bauxite for the Lanjigarh Refinery from bauxite mined in the Niyamgiri Hills, but was unable to do that because of the ban. recently oil in the ecologically fragile Mannar region in Sri Lanka. Britain with a £20 million home in Mayfair. His family own 62% of the company through various tax havens. chimney collapsed on them. Vedanta claim only 42 died but between 60 and 100 are still missing. under constant surveillance rather than be rehabilitated. x acceptable levels of manganese were found in water depended on by 50,000 people. the Dongia Kondh tribe would be affected detrimentally if the mine went ahead.